Lincoln Industries is the largest privately-held metal finishing company in North America. Through its 64 year journey, Lincoln Industries has been leading the industry in metal finishing, supply chain management, customer service, innovation and establishing a company culture that is nationally known. As a talent-based organization, we have developed a process that ensures we have the right people in the right positions in order to grow our business and help each individual succeed at work and at home. 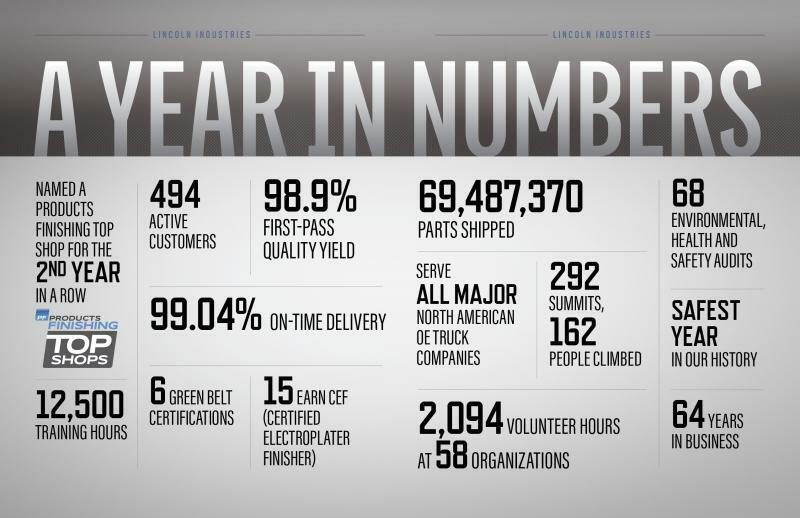 VIEW OUR YEAR IN NUMBERS. Our vision, mission and values drive our culture, our work and our success. Named seven times as one of the best medium sized companies to work for in America, our culture inspires our people to be the best versions of themselves, both at work and at home. We are committed to the wellness of Lincoln Industries' people and their families. We encourage a balance between work, home and personal goals. Join our talent-based organization, with an award winning culture and strong wellness, learning and development and recognition programs. Safety and Environmental Responsibility are commitments we've made to the community and each other.